Nestled in the picturesque village of Oia Santorini, the Kirini Suites & Spa combines the Cycladic architectural tradition with luxurious living and the serene landscape of the Aegean. Set atop a cliff, this Relais & Chateaux resort affords mesmerizing views of the Caldera Volcanic Islands and magnificent sunsets. Beautifully appointed suites, decorated with stylish simplicity, provide an idyllic retreat after a day of exploring the many wonders of Santorini. 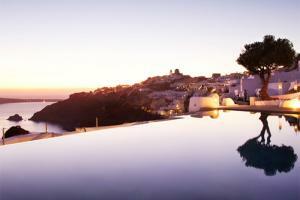 Located in the village of Oia Santorini, just 20 minutes from Santorini International Airport. The White Cave Pool Lounge & Cocktail Bar, The White Cave Dinner Restaurant, The Wine Cellar. The Cultural Center, Ammoudi Beach, Armeni Beach, Art Galleries, and a Maritime Museum.